After a very tough, rl, week, I took the weekend offline to recharge my batteries. Been out on my bike and cleared my head. I think all will be 100% okay soon! So, I logged in briefly and was delighted to find out that my neighbour had put his beach side parcel for sale. 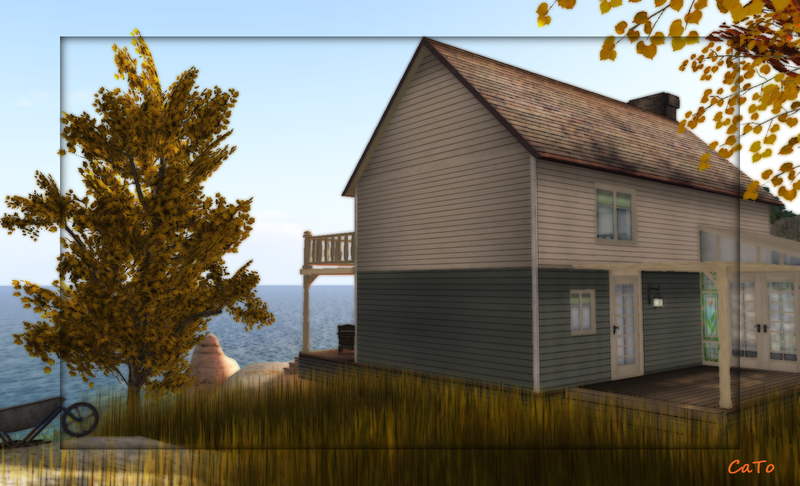 I did not gave it much thought and bought it, meaning my lovely piece of mainland is now bordering the Linden Road and on the other side the Linden Ocean! Yay! It is not really a tropical sim, the groundtexture is a bit mossy-rock, but I kinda like it. I am not into tiki and tropical anyway! I did not had a lot of time so I only placed a larger house and planted some autumn-trees and grass. The home is still empty..haha. Will give me something to do later this week, when I hopefully have all my inspiration and the right spirit back! Congrats on your purchase of land and home! Looks like you will be very comfy there. Thanks Venus! I am sure I will, I feel a bit fortunate to have a parcel bordering road AND ocean! So when is the housewarming party?